Sweden’s Ice Hotel is built from scratch every year. A new design, new suites, a brand new reception – in fact everything in it is crisp and new. The Ice Hotel is situated on the shores of the Torne River, in the old village of Jukkasjärvi in Swedish Lapland. 10,000 tons of crystal clear ice from the ‘ice manufacturing plant’, the Torne River, and 30,000 tons of pure snow generously supplied by Mother Nature are needed to build the Ice Hotel every year. The hotel sleeps over 100 guests, and every bedroom is unique. 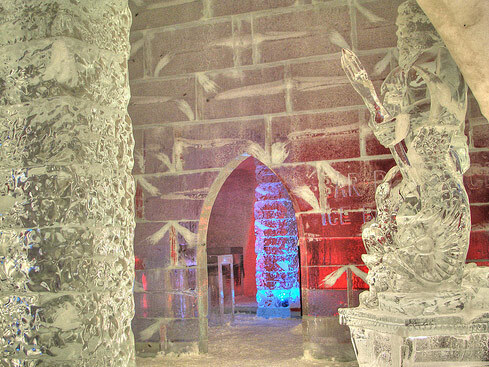 Covering more than 30,000 square feet, the Ice Hotel includes an Ice Chapel, the hotel itself, an ice art exhibition hall, a cinema and last but not least, the world famous Absolut Ice Bar. Rebuilt every year out of ice and snow from the pristine clear waters of the Torne River, the Ice Hotel is a sight to behold. 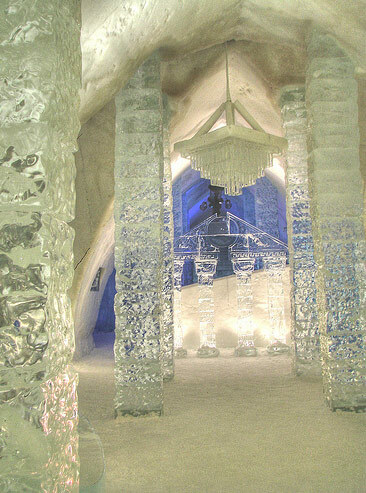 Touted as the world’s first ice hotel, its halls are filled with ice exhibits, ice chandeliers, and unique rooms which are rebuilt every year. It boasts over 80 rooms and suites, a bar sponsored by Absolut Vodka, a reception, and a church. Nuptials are exchanged in the church, mostly by tourists who find its location and appeal very exotic. The day before our visit, a Scottish couple had tied the knot at the church, with the groom donning his traditional kilt. The hotel comes to life only between December and April every year, and it costs about $196 per night to sleep in an ice cold room atop reindeer skin. 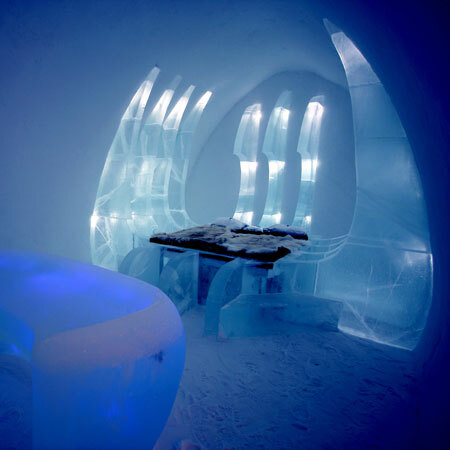 The rooms are simple – blocks of artistically carved ice with stacks of reindeer skin lain over. You could easily spend hours navigating the maze of amazingly designed rooms. The interior décor – shelves, stools, chandeliers, all made of ice – were quite impressive. Ice sculptures of native animals such as reindeer and moose adorned its grounds. The hotel itself was shaped like an igloo, and we joined a guided Swedish language tour of the grounds to learn more about its history and the many artists who collaborate on the hotel’s construction every year. A quick stop at the Absolut Ice bar for a sip of vodka, and hunger had begun to set in. Lunch was a nice clean Scandinavian buffet – five different types of pickled fish and some salmon – at the Old Homestead Restaurant which is a brisk 800 meters from the hotel. Спасибо за пост! Добавил блог в RSS-ридер, теперь читать буду регулярно.. This is the most beautiful of any palace, even those made with gold. Structures like this are certainly natural works of art, and take my breath away!!! There is an ethereal presence in such habitations. There is one up in Canada as well in Quebec. I am adding your blog on my friends list. Great blog.